Stephen A. Hart is a brand strategist and the founder of Isles Media, LLC. He is also the creator of Brand You™, a digital platform that provides done-for-you services to help entrepreneurs and professionals create a digital footprint by expressing their passion and creativity so they can change the world. Stephen also owns, operates, and hosts Trailblazers.FM, the top ranking podcast that interviews black industry leaders, professionals, and entrepreneurs. Due to his efforts, he was selected ... See More as one of the 100 Modern Men of Distinction by Black Enterprise. 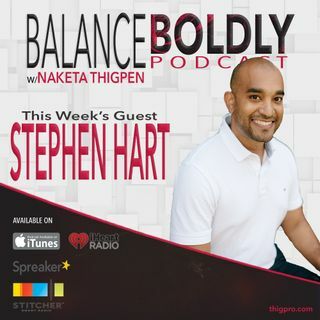 Stephen joins me today to share how he blazed trails -- the story of his success, sudden downfall, and how he used his time to take a break from entrepreneurship to reflect, gain clarity, pivot, and refocus on what was important in his life. He shares how his daughter impacted his decision to create Trailblazers.FM™ as well as how your personal brand impacts your success. He also shares the turning point that led him to intentionally care for himself as well as what gives him a greater sense of purpose as he achieves his goals.